Matrikunj—‘Mother’s Garden’, the sustainable development arm of Sri Aurobindo Society, organized a day-long Exposure Trip for a first-hand, up-close experience of a self-sufficient practice of natural, organic and conscious farming for a Cuddalore-based NGO named ‘the Rural Education and Action for Liberation’ (REAL). The educational visit was conducted on September 19, 2017, for 30 farmers. Their aim was to understand how livelihood could be sustained and enhanced through organic farming methods. 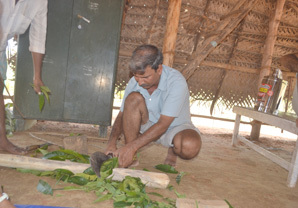 Baburam, the farm in-charge, took the visitors out for a walk and showed them components of natural farming and herbal gardening that can be a complimentary aid to the usual farming techniques. Baburam is our residential agriculturist, herbalist and researcher who has a traditional farming background from the state of Orissa. Inspired from the Mother’s teachings and words, Baburam has experimented with various natural and organic farming techniques and is now an ocean of knowledge and experience. His efforts have been recognized by South Asia Rural Reconstruction Association (SARRA).